Jurassic Trek is a spoof of the original Classic Trek series, including crew info, links to comic strips and other cartoons. 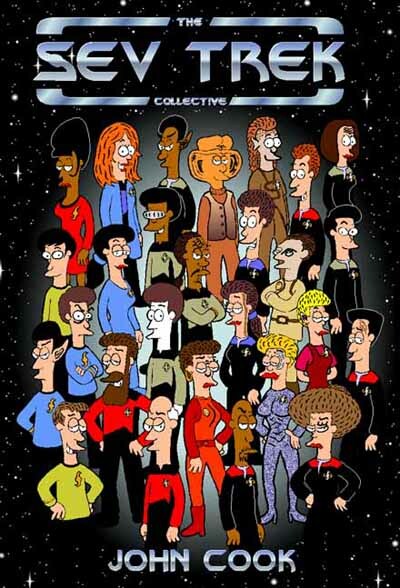 Deep Sev Nine is a spoof of Deep Space Nine: the next generation after the Next Generation. Join Captain Schidzo and his motley crew as they boldly go... well... nowhere. Forager is a spoof of Star Trek: Voyager, featuring cartoons, crew info and the popular Forager T-shirt. The Sev Trek comic strip is a weekly comic that asks the questions everyone else is afraid to ask! Why is Captain Pickhard's accent English if he's from France? Why have Klingoff foreheads changed over the years? And just how many shuttles does the Sevship Forager have? Be a part of Sev Trek and help write a Sev Trek cartoon! The Write Your Own Sev Trek Competition receives over 1000 punchlines a week and the page is updated daily with all the funniest submitted punchlines (which are always entertaining). Publish Sev Trek in your fan club newsletter! The Sev Trek Discussion Board is a busy, vigorous forum where Sevilians chat with each other about Sev Trek issues, Star Trek episodes and whatever else takes their fancy. The Sev Trek Ideas Board is a more specific forum that allows Sevilians to suggest cartoon ideas, propose alternative Sev Trek names or discuss other's ideas. If you want to contact other Sevilians (readers of Sev Trek), you can find their email and ICQ numbers at The Sev Trek Contact Page, your one stop to getting in touch with your favorite Sevilians! This is a bold new iniative created by Nick Naraht Frame, and you're all invited to become a Sevilian (spelt with one L) by joining the page! The richness of the Sev Trek site is largely due to contributions from thousands of readers from all over the world. I am now attempting the herculean effort of giving credit to everyone who has contributed to this site. Here is a summary of all the Sev Trek merchandise available for sale from this web site: the Sev Trek Book, T-shirts, Mousepad, Keyring, Bookmarks and Poster . View pictures of all the Sev Trek merchandise and read comments from buyers. Find out about the Sev Trek Book, The Sev Trek Collective here. Includes links to Comments from buyers, a preview of the new story Send in the Clones and a close up of the front cover. The Sev Trek Poster is an A2 sized crowd scene featuring every Sev Trek character (plus a few other surprises). If you're part of a fan club and know other members who might be interested in buying Sev Trek merchandise, you can get discounts and freebies if you group order. The Great Link is your link to the great sea of Trek resources on the web. It connects to web sites featuring news, actor gossip, fan fiction, newsgroups and every conceivable piece of Trek info. You can publish the Sev Trek comic strip on your own site! Just make sure you follow the instructions. Link to Sev Trek, using this Picard icon or a text link, and I�ll link back to your site. If your site contains Star Trek info, your site will become part of The Great Link. Are you looking to increase the number of visitors to your web site? Place your own banner ad on any Sev Trek pages! If you�re interested, you�ll want to find out more details and how to place a banner ad. Every Sev Trek character has a alternative Sev Name - a comprehensive list is found in the Sev Trek Names Page. This page is useful if you're entering the Sev Trek Competition and you need to know the Sev Name for a particular character. Learn about sev experiences at Sci-fi Conventions. NOTE TO CONVENTION ORGANISERS - if you'd like to invite me to your convention, feel free to email me. Check out all the web sites created by Sevilians devoted to Sev Trek issues. Most of these sites are devoted to the Sevilian community so visit them to join in on all the fun! As well as getting reading Sev Trek cartoons for free, there are other freebies you can download for nothing! Sev Forward is the ideal way to get to know your fellow Sevilians. It features photos and personal details of Sevilians - drop by and tell us about yourself too! Sev Trek has been translated into many languages, including Klingon and Vulcan! Ordering over the Internet is still a new experience for a lot of people. I've attempted to answer some of the common questions about online ordering at the Sev Trek Ordering FAQ Page. The morning of October 3 was a dark sordid day in Sev Trek history. The winning comic strip punchline was chosen by judges only to be overruled by Wendy and myself. This dark chapter has gone down in Sev Trek annals as Overrulegate. Find out how the Sev Trek comic strip was used at the Kling-con �97 Convention. We�ve all spent sleepless nights wondering why Klingon foreheads changed from TOS to TNG. I ran a contest in the Sev Trek Competition to see what people thought of the issue and was surprised with the amount of response I got. Follow the process of creating a Sev Trek episode. I take you through the development of the initial concepts to the writing and drawing to the computerising of the final comic. Read what people have said about Sev Trek and find out just how squeamish Sev Trek readers are! Alternatively, you can leave your own comments here. Here are scans of newspaper and magazine articles about our web site.